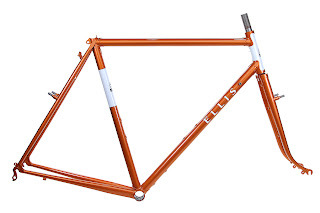 Ellis Cycles is moving along, should have pictures in the next couple days of my road bike. Jason's had it for a couple months but with his shop getting started and me needing customer frames painted it has been on the back burner. If you're in the area, it sounds like it should be a cool event and it's a nice place to see my frames up close and personal. 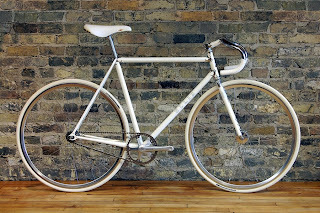 I may even be able to convince Todd R. to let me show his award winning single speed. 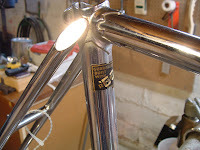 Another spot to watch an Ellis take shape will be on: http://mnbicyclecommuter.blogspot.com/ , I'm glad to announce that Doug has put in his deposit and will soon be a proud owner of an Ellis. He's promised to document the build process from his perspective. 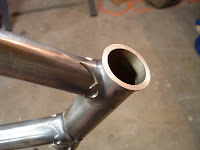 I sent in my payment last month for the 2009 NAHBS booth, http://www.handmadebicycleshow.com/index_01.htm , I'm already getting traffic on my website from theirs. Also have some cool ideas for show bikes, but I'm keeping them under my hat for now. 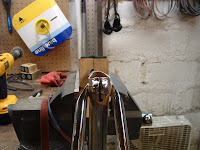 That's all for now, other upcoming projects include Ellis jerseys, and a special retro build for Emanuel in Montreal. 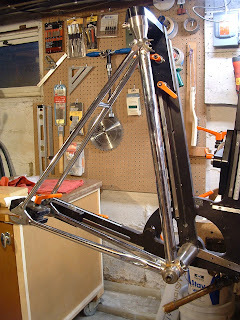 Here's the finished randonneur frame. 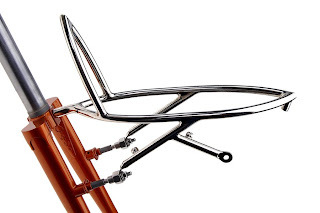 My very first custom front rack! 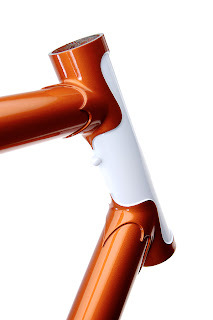 These last couple are just glamour shots of Jason's beautiful paint work. 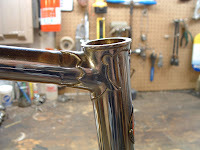 Here's a 1972 Paramount track frame that has seen better days. It's had a nice front end collision and has been sitting around ever since. I always like doing these jobs because they almost always look better after the repair than they did when they were new. 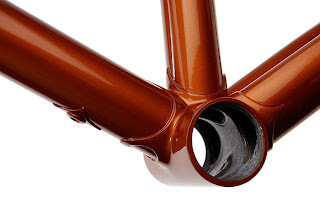 Some closer shots of the head lugs, you can see the tube has completely pulled away from the down tube lug. 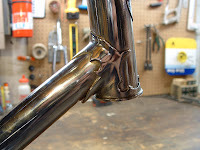 After pulling the tubes out, I found that the whole bottom spoon area of this lug was charcoaled and had no braze whatsoever. 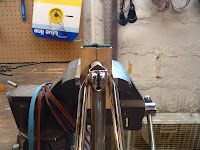 The seat lug is also a little rough finishing wise, I'll try to fix this as much as possible, but with the seat stays in the way it's a little tricky. 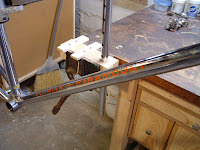 Vintage Paramount decals. These are water release, so when I soaked the flux off, they got a little jacked. 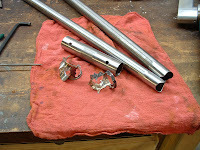 The tubes are out and I've cleaned up the seat tube and bottom bracket sockets. 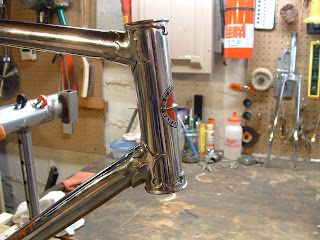 Now I just need to miter my front end tubes and clean up the head lugs. After some careful file work the head lugs are presentable. 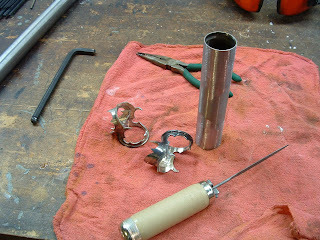 And now I've got the tubes mitered up. After some quality time with the files and emery it's read to see the road, (or track) again. 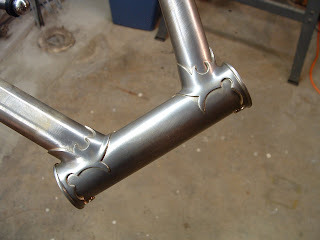 The lug edges are nice and crisp now. Just how I like em. 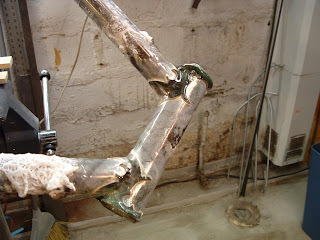 Below is a nice before and after of the seat lug. 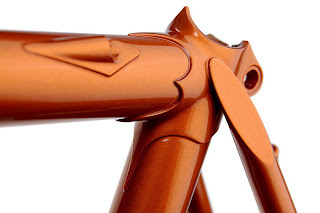 The profile of the lug is a bit off before, (understatement), I tightened it up a bit, and while I was at it I tried to even up the keyhole at the bottom of the seat post slot.